Garden & Animal Paradise between the coast and the mountain foothills. High spec build of traditional Alpujarra cottage with mountain views. NEW AIRCON. We pride ourselves on the quality accommodation at a fair price with a very high standard of cleanliness and consideration for our guests. Air con now installed! Situated between the coast [35 to 40min], Granada 1 hour] and the ski resort less than 1 and a half hours away. Country walks, from your doorstep. Enjoy the large private pool (8 x 5 x 2] and spacious terrace, wander through the gardens and olive grove or play table tennis by the pool. Wireless internet and UK TV, DVD players plus children's games available to complete your stress free holiday. We are on hand to welcome you to the casita, help with any information on local bars, restaurants, places to see, the best times to visit the famous Alhambra Palace and any other questions you may have. Easy access via tarmac country road [ no dirt tracks or pot holes to challenge your car!] Great air quality- no pollution here! Water supply! : An important question to ask when staying in rural Spain is 'What happens when the water is cut off?' as this happens a lot - there may be a repair needed or a shortage of water in the area - and you rarely get any warning!. We have a back up system of 1000 litres at the flick of a switch -so there is no inconvenience to our guests. Check this point before booking your holiday! Home Produce & Green/ Eco friendly: Our vegetable garden supplies us and our guests with fresh produce. We also have our own fruit; oranges, lemons, limes, apricots, plums, nectarines, pears and kaki for all to enjoy in season! We have hens and ducks for our own supply of eggs and pigs also make an appearance at our place from around June to January! Turkeys, peacocks and LLAMAS complete the menagerie!. Don't worry, they are all at a short distance from the casita but great fun to visit - especially for the children. Birds abound! So many different species of birds can be seen and heard- from Nightingales to the amazing Golden Orioles and Eagles. We moved to Spain from the Surrey / Hampshire area of southern England. There we both had normal jobs and brought up our 4 sons, played plenty of tennis and had a very busy life. Our sons, now all adults, visit frequently but live either in London, UK or the U.S. We have been described as a variation on The Good Life's Tom and Barbara but I am not so sure!! We do have 2 dogs, 3 cats a dozen hens, turkeys, a variety of ducks, peacocks, llamas and July to Feb we have pigs. We now spend most of our time tending the garden and the animals plus producing vegetables when we have the time! We also open the Orgiva Tea Garden once or twice a week for all to visit in the main garden away from the casita. The 360º views and the proximity to the coast, the mountains with the ski-ing and Granada city. It a haven of clean air wonderful views and great scenery. Both bathrooms are modern and well equipped with good lighting, razor sockets and incorporate local mosaic tiling. Bathroom 1 is the shower 'wet room' with a drop down seat in the shower, triple mirror over the basin, loo heated towel rail and first aid cabinet. Additional Bathroom 2 is en suite to the additional 3rd bedroom with mirror over basin, bath with shower over, loo and heated towel rail. Good quality towels for bathroom use supplied plus plenty of hot water. Try the up and coming new game PADEL! Available in the village. A cross between tennis and squash and table tennis! Check it out on youtube! Once you've tried it you will love it! For the children we have books,. duplo and lego and board games plus great children's bed linen and having brought up 4 boys we have some understanding of their needs! The pool is 5m x 8m with wide steps to sit on and enter the pool. It is cleaned and the terrace is swept early every morning. There is a bolted gate between the private garden and the pool area to give extra peace of mind. There are no steps, so pushchairs can move with ease from the car to the house to the pool! For wheelchair users and the elderly or infirm- With no steps from the car to the house to the pool, wheelchairs are very welcome. The doors are wide [80cm wide] including the bathrooms to help make your stay just a little bit easier and all light switches are at 1.1m high. 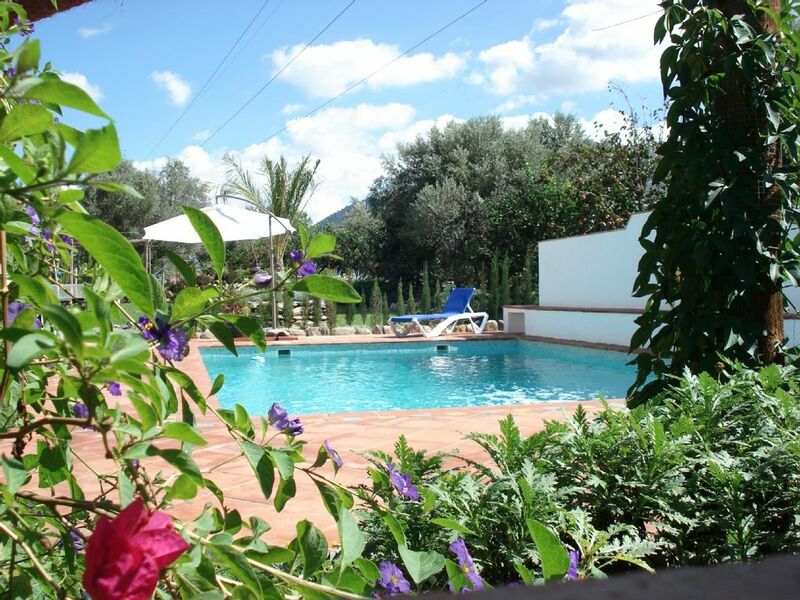 Wonderful casita in stunning setting with beautiful garden and fantastic views. We stayed at this beautiful casita for a week in November and had a wonderful time. The place is well equipped, stylish, cosy, and is in a fantastic setting. The owners Kay and Bernard are very friendly and could not have done more for us. We would definitely recommend this lovely house to anyone wishing to spend some time in the stunning Alpujarras and will surely be back again. We felt very lucky to have found this place to stay. Fab for adults & kids alike. We will be back! Kay and Bernie have created a wonderful place to stay close to Orgiva town. The kids loved the pool and table tennis and the animals. We enjoyed having a fabulous garden to stroll in, great views, good walks around, and having Kay & Bernie’s local knowledge easily available. The house is well equipped and was ideal for our family (with aunty in the extra bedroom with en-suite!) I have been recommending this place to my family and friends - we will definitely be coming back! It's definitely a home away from home with lots of extras. We had a relaxing stay, which was just what we needed. Kay and Bernard made us feel welcome but they also left us to enjoy their lovely casita and the pool in complete privacy. Their gardens are beautiful, it really is an oasis. The local town has enough restaurants to allow you to eat out but we were able to stay in and cook too. We are quite fussy about where we stay but we give five stars to Kay and Bernard..
Lovely pool and great relaxation with the town 2km away with lots of supermarket / butcher and bakery choice and a range of shops and cafe’s. Lovely walks in the hills surrounding the accommodation and along the waterways. Kay and Bernie were the perfect hosts with great knowledge of the area and helpful advice. Loved the gardens and animals. As all the other reviews have said, Las Chimineas is a delight as are Kay and Bernard the hosts. The property is attached to the Orgiva Tea Garden (of which you have access to at any time) which Kay and Bernard have put enormous amounts of effort into making an incredibly diverse and tranquil garden (with a cafe on Wednesday and Saturday). Our kids (9,7 and 5) loved playing in the pool, feeding the chickens, peacocks, geese, turkeys and llamas, and having the freedom of the garden. The house itself is incredibly comfortable and well thought out and Kay and Bernard made our stay special. The location is lovely and close to many walks and villages. One of the loveliest places we've stayed. This place really was a paradise. The house was bigger than expected and very comfortable - they even had boxes of lego for our two boys. The pool was great and very clean. It doesn't have a shallow end which was perfect for our kids, who love jumping and diving. There's a nice shady area by the pool to sit when it gets too hot and a ping pong table if you're feeling active. There's a separate private outside eating area with a beer fridge (nice touch) as well. Kay and Bernie were great hosts. Very friendly and caring. Kay even came to check we were OK when I had been ill. As guests at La Casita, you also have access to their beautiful garden, which they open to the public two days per week. They had an amazing Spanish guitarist playing in the garden one day which was just lovely. We really loved their two dogs, four cats and host of birds, included several peacocks. The absolute highlight though was walking their llamas down to the river for a paddle. Highly recommended. Country location between the coast and the Sierra Nevada mountains. Soak up the atmosphere of Chris Stewart's 'Driving Over Lemons'. Situated in the natural park of the Alpujarra, Las Chimeneas [the chimneys] has the tranquility of the countryside with magnificent 360º views with unbelievable sunsets. Fantastic for painter too! The amazing routes up through the mountain villages are an absolute must with incredible views around the mountains. Enjoy the local cafes for your taste of the area + free tapas [ small plates of tasty food] with every drink! Granada- 1 hr- see the magnificent Alhambra Palace and discover the wonderful small intimate historic city. Have a Turkish bath! Walk through the old Moorish quarters. Only 40 minutes to the coast with loads of different beaches and villages with the Chiringuitos [restaurants actually on the beach] for lunch watching the Mediterranean in front of you. Other Activities: On your doorstep (literally)enjoy homemade tea and cake at The OrgivaTeaGarden [www.orgivateagarden.com]plus the magnificent gardens; children's trail, painters' delights and all the animals including llamas, peacocks, pigs, hens, turkeys, ducks and geese!